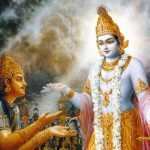 In this verse Arjuna is addressed as Gudakesha, which means “one who has conquered the darkness of sleep.” For those who are sleeping in the darkness of ignorance, it is not possible to understand how the Supreme Personality of Godhead manifests Himself in various ways in the material and spiritual worlds. 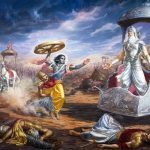 Thus this address by Krishna to Arjuna is significant. 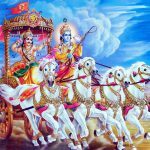 Because Arjuna is above such darkness, the Personality of Godhead agrees to describe His various opulences. The three purusha-avataras are described in Srimad-Bhagavatam. 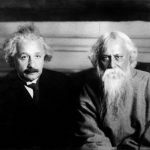 They are also described in the Satvata-tantra. 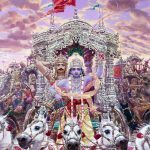 Visnos tu trini rupani purushakhyany atho viduh: the Supreme Personality of Godhead manifests three features—as Karanodakashayi Vishnu, Garbhodakashayi Vishnu and Kshirodakashayi Vishnu—in this material manifestation. The Maha-Vishnu, or Karanodakashayi Vishnu, is described in the Brahma-samhita (5.47). Yah karanarnava-jale bhajati sma yoga-nidram: the Supreme Lord, Krishna, the cause of all causes, lies down in the cosmic ocean as Maha-Vishnu. Therefore the Supreme Personality of Godhead is the beginning of this universe, the maintainer of the universal manifestations, and the end of all energy. First you should think of me alone as the cause of all these vibhutis by one of my portions. I am atma, the soul within prakrti, the creator of the mahat tattva, the purusa, the paramatma (karanodakasayi). O one who conquers sleep (gudakesa), you are qualified for meditation since you do not sleep. I am situated in the aggregate of all beings (vairajas), as the antaryami of the virat (garbhodakasayi). I am also situated within the hearts of all living entities, as the antaryami of the individuals (ksirodakasayi). (Two meanings are given to the phrase sarva bhutasaya stithah). I am the creation (adih), the maintanance (madhyam) and the destruction of all entities. aham — I; ātmā — the soul; guḍākeśa — O Arjuna; sarva-bhūta — of all living entities; āśaya-sthitaḥ — situated within the heart; aham — I am; ādiḥ — the origin; ca — also; madhyam — middle; ca — also; bhūtānām — of all living entities; antaḥ — end; eva — certainly; ca — and.